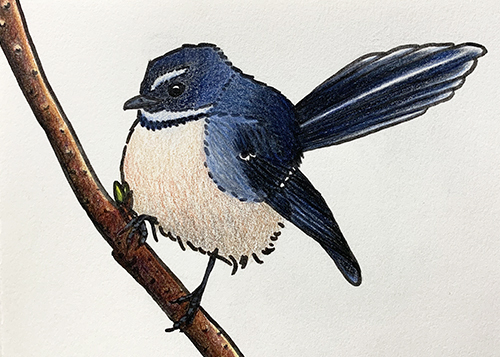 A couple of days ago, I saw a photo of a New Zealand Fantail on eBird and I couldn’t resist drawing the little bird. The photo was taken by Steve Kelling at Okia Reserve, New Zealand (near Dunedin). Steve works at the Cornell Lab of Ornithology and has seen 2671 bird species. Très cool! I drew the wee bird in my wee 4 by 6 inch notebook with a black brush pen and colour pencils. Tu as la main tres habile.? Combien heure requises pr ts ses petits details? Son oeil est tres expressif ,un peu inquiet n est ce pas. Il devait te voir le photographier. La temp.. a St- Lo est difficile sur le moral. Penible a supporter. J ai tres hate au printemps…. Merci pr partager ton bonheur. Salut mami :-). Merci pour ton gentil message. J’espère que tu passeras un bel hiver avec de la belle neige et que le printemps semblera donc moins loin. Ce n’est pas moi qui a pris la photo. C’est un petit oiseau de la Nouvelle Zélande et de l’Australie. Je voulais faire le dessin en une heure mais il m’a pris 2 heures. Bisous et bonne journée! Well done! Gotta love that tail! Thanks, Carol :-). That is an awesome tail! I was pretty excited to find out there are about 40 species of fantails! Thanks :-)! He/she does have a wonderfully perky tail! Thanks, Erin :-). Glad you enjoyed this drawing and got to enjoy these little beauties in real life! Very pretty and unmistakable. The fantail’s Maori name is evocative- piwakawaka. Stunning! They are the most curious birds… as you walk along in the bush they will hover just by you and if you are lucky enough they will actually come sit on you. Neato, sounds awesome! Thanks for sharing that experience :-). Are they that curious because people feed them? In Canada, I’ve only had wild Black-capped Chickadees land on me because they are ok with eating seeds from people’s hands in the winter.